Shirts With Random Triangles: Ohio State adds five-star defensive end prospect Nick Bosa to its 2016 recruiting class. Ohio State adds five-star defensive end prospect Nick Bosa to its 2016 recruiting class. Nick Bosa. Image via 247Sports. Ohio State has added a five-star prospect to its 2018 recruiting class. Ft. Lauderdale, FL. high school rising senior defensive end Nick Bosa, ranked as the top strong-side DE prospect in the country for 2016 by 247Sports, committed to the Buckeyes on Thursday. 247Sports grades Bosa as a composite five-star strong-side defensive end prospect. The recruiting website currently ranks Bosa as the no. 1 SDE prospect for 2016, as well as the no. 8 overall prospect for 2016, and as the no. 2 2016 prospect for the state of FL. The ESPN 300 ranks Bosa as the no. 3 prospect for 2016. 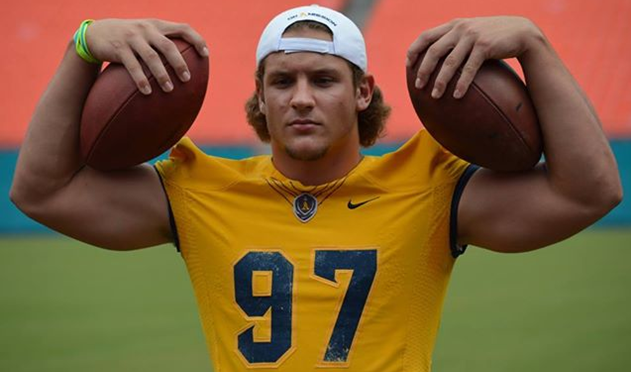 Bosa attends St. Thomas Aquinas High School in Ft. Lauderdale, FL. He stands 6’4, and weighs 265 lbs.